Studio Line: Columbia TriStar - They were shipmates at war...with each other. 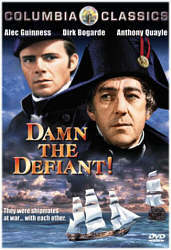 Alec Guinness must battle a mutinous crew and Napoleon's fleet in the rousing, historical adventure Damn The Defiant! As commander of the British warship H.M.S. Defiant, the humane Crawford (Guinness) strives to maintain order throughout the ship against the ceaseless brutality of sadistic first mate Scott-Padget (Dirk Bogarde). After Crawford is injured in a fiery battle with a French treasure ship, angry seamen Vizard (Anthony Quayle) leads the crew to mutiny when Scott-Padget takes over. Now with Vizard in command, Crawford persuades him to join the British fleet to help fight against France's planned invasion of England in hopes for a mutiny pardon. But when a vengeful sailor murders Scott-Padget, the Defiant crew must decide between saving their country or their own lives. DVD: Widescreen 2.35:1/16x9, standard 1.33:1; audio English Digital Mono; subtitles English, Spanish, French, Portuguese, Chinese, Korean, Thai; closed-captioned; double sided - single layered; 28 chapters; rated NR; 101 min. ; $24.95; street date 10/10/00. Supplements: Vintage Advertising; Theatrical Trailers; Talent Files; Production Notes. October 1, 2000 will forevermore be called "D-Day". This is because I watched four DVD s on this lazy Sunday: Dillinger, The Delta Force, Delta Force 2, and Damn the Defiant!. Dude's dreadfully disturbed, dagnabbit! Some other "D" words describe the films of the day: "drab" and "dull". None of these four movies were poor, really, but all were fairly lackluster. 1962's Defiant probably offered the most satisfying experience of the four, but based on its pedigree, I found it mildly disappointing. The film focuses on the activities about the Defiant, a British warship in the late 18th century. Headed by stolid Captain Crawford (Alec Guinness), rumblings of discontent emerge due to the vicious discipline meted out by first mate Scott-Padget (Dirk Bogarde). Eventually the situations becomes more and more tense and actions must be taken to resolve the concerns, one way or another. Defiant definitely sounds interesting, and for the most part it is, but I found the results to seem fairly lackluster. It's one of those problems I have trouble explaining, because the movie seems well-executed. Guinness maintained his usual level of solid acting, and Bogarde was quite strong as nasty Scott-Padget; he definitely created the most lively and full-blooded character of the batch. Director Lewis Gilbert - who also helmed a couple Bond films, 1967's You Only Live Twice and 1977's The Spy Who Loved Me - fashioned a fairly tense and compelling piece that particularly excelled during the sea battles; these dramatic cannon-based fights seem nicely rendered and appropriately explosive. And yet, I just couldn't get terribly interested in this film. It had its moments, and the nicely-depicted action sequences certainly helped, but those were fairly few and far between, and the other parts of the movie weren't as stimulating. The characters generally appeared drab and bland and they did little to evoke my interest or sympathy. Guinness added some dimension to a flat role, but there's only so much he can do, especially since Crawford really is a low-key persona. Perhaps I'll be in the minority on this one, but I felt Damn the Defiant! failed to deliver all the thrills and excitement it promised. Overall, the story provided some intermittent action and punch but it generally was rather dull and slow-moving. It probably didn't help that the plot synopsis on the back of the case revealed too much of the exposition - skip it if you haven't already seen the film! Damn the Defiant! appears in both its original theatrical aspect ratio of approximately 2.28:1 and in a fullscreen edition on this double-sided, single-layered DVD; the letterboxed image has been enhanced for 16X9 televisions. Only the widescreen side was rated for this review. Although the movie generally seemed watchable, it presented a lot of problems that made it passable at best. Sharpness usually looked fairly crisp and accurate, but some mild softness can interfere at times. The fuzzy qualities are never severe, but in combination with the image's other problems, they may come across as worse than they actually are. Moiré effects and jagged edges presented minor concerns, and I detected only modest artifacts from the anamorphic downconversion on my 4X3 TV. Print flaws offered more serious problems, though these weren't terribly significant. I saw moderate grain throughout the film, and also witnessed speckles, grit, some nicks and a couple of small hairs. Colors usually appeared drab and lifeless. Some of the officers' dark blue uniforms seemed mildly rich, and a few reds from the clothes of the French were acceptably solid, but the general palette looked slightly faded and dull. Black levels came across as acceptably dark most of the time but could often be bland and slightly gray, and shadow detail usually seemed excessively heavy and thick. The latter was affected by the use of "day for night" photography which uses filters to make daytime shots look darker; these images often look artificially dim and can seem fairly impenetrable. Filters caused other problems in Defiant as well. They seemed to contribute to the graininess of the picture, and I also saw a few occasions during which we witness odd fluctuations in tone; it looked like the filters were taken off briefly at times and we see the brightness jump for a moment. Ultimately, Defiant seemed watchable for the most part, but it possesses quite a few problems. Even less impressive was the monaural soundtrack of Damn the Defiant!. Dialogue seemed acceptably clear and intelligible but could appear rather thin and brittle; the speech often displayed a mildly edgy quality that sounded odd. Music appeared clean but drab, with little life to it or dynamic range. Effects were also generally clean but without heft or power; the cannon battles showed some minor distortion but were basically just bland. Oddly, the only serious examples of distortion came from drumrolls; these sounded terribly harsh and muddled. For a nearly 40-year-old movie, the soundtrack isn't terribly poor, but it seemed flat and ordinary at best. Damn the Defiant! offers few supplemental features. We find a "Vintage Advertising" section which provides stillframe images of five posters and lobby cards. It's a fairly dull area, but it was interesting to note that the film's British title was H.M.S. Defiant - guess they figured American's wouldn't understand what "H.M.S." meant. We get a few trailers. The original clip for Defiant appears, and we also find ads for some other combat-oriented films: promos for The Caine Mutiny, The Guns of Navarone, and the 1997 reissue of Das Boot show up on the DVD. This disc includes some typically-weak "Talent Files". Columbia-Tristar usually do a poor job with these, and the entries for Guinness, Bogarde, and director Lewis Gilbert are no exception. Finally, the DVD offers some brief but mildly interesting text production notes in the booklet. Although Damn the Defiant! is a decent film, I must admit I found it disappointing based on its pedigree. It clearly doesn't compare with the other 1962 movie that featured Alec Guinness and Anthony Quayle (that'd be Lawrence of Arabia). The DVD provides very mediocre and flawed picture and sound plus no significant extras. Fans of this form of naval drama may want to give it a look, but I can't recommend Damn the Defiant! with any eagerness.